I have been nominated for the Liebster Award by the lovely Emma B! Thank you Emma, this is so exciting! The Liebster Award is a way to give new bloggers with less than 200 followers to gain more recognition, help their blogs grow and let their readers know more about them. 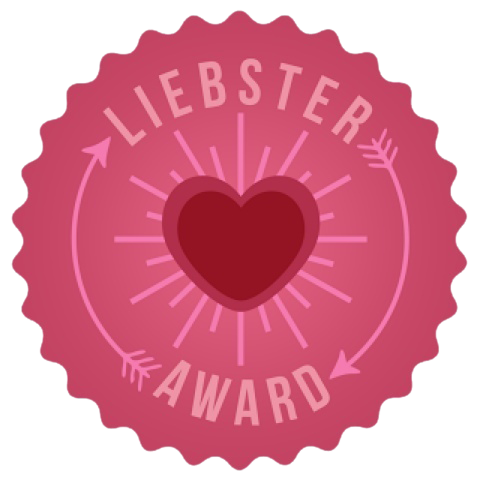 The Liebster Award is a really great way of sharing and discovering new blogs and bloggers. Here are my 11 questions set for me by Emma! 1) If you had to take part in any reality TV show what would it be? Coach Trip, I adore the show and have Brendan the tour guide on Facebook :) . It’s such a funny show with bits of drama, I wouldn’t know how I’d cope stuck with a coach full of people though! 2) Would you rather only eat chocolate flavoured crisps or crisp flavoured chocolate? errrm…chocolate flavoured crisps? Rose made chocolate covered prawn cocktail crisps once which were actually pretty fab. 3) What’s your favourite type of clothing / accessory? Rings, I love my rings and wear a few all the time. 4) If you had to be stuck in a lift for 24 hours, which 3 people would you choose to be stuck with? 5) What would you serve at a 3 course dinner party? As I’ve planned what I would serve if I ever went on Come Dine with me I know :P. For starter I would serve bruschetta with creamy mushrooms and caramelized onion. For main home-made lobster ravioli. For dessert either NY cheesecake or Banoffee pie. 6) If you could visit any place in the world where would it be? 7) What’s your favourite animal? Badger or Owl, so cute! 8) Why did you start your blog and how did you choose it’s name? We started the blog as it was a topic we both were interested in writing about and thought it would be a great thing to do as sisters. A friend also writes a blog and having seen how much fun she has from doing it we were inspired to do the same! We chose the name as it works as an entire word -www.strikeapo.se with no .com etc pretty cool huh? 9) Do you have any brothers or sisters? 3 Sisters in our family, Mary and Rose who run the blog and a younger sister. 10) What’s your favourite type of blog post to write? I love writing posts about nail art and tutorials, there are so many patterns/designs/techniques and they are so much fun to do. 11) Who’s your celebrity style icon? Audrey Hepburn, Fell in love with her after watching her in Roman Holiday with her effortless class grace and fantastic cloths. Now for 11 Random Facts about me! Recently graduated with a first in animation. My favourite film is Shaun of the Dead. Black and White movies are my guilty pleasure. I used to work as a carer for disabled adults. I’m a real nerd and love maths! I have a piercing in my nose and lots in my ears, maybe 10. I am the clumsiest person in the world, ever. My hair colour changes all the time. I love doing crafts and baking. Tweet me the link to your posts as I cant wait to read them! If you were stuck on a desert island what three things would you take with you? What one item could you just not live without? Which fashion icon inspires your style the most? If you had to, which TV show would you go on? What inspired your blog and the name you chose for your blog? Which 3 people would you invite to a dinner party? Whats your favourite song to dance to in front of people? Whats your favourite song to dance to when no ones watching!? If you could only shop in one clothes shop for the rest of your life, where would it be?